This lesson will help you understand how to use the search facilities to full advantage. 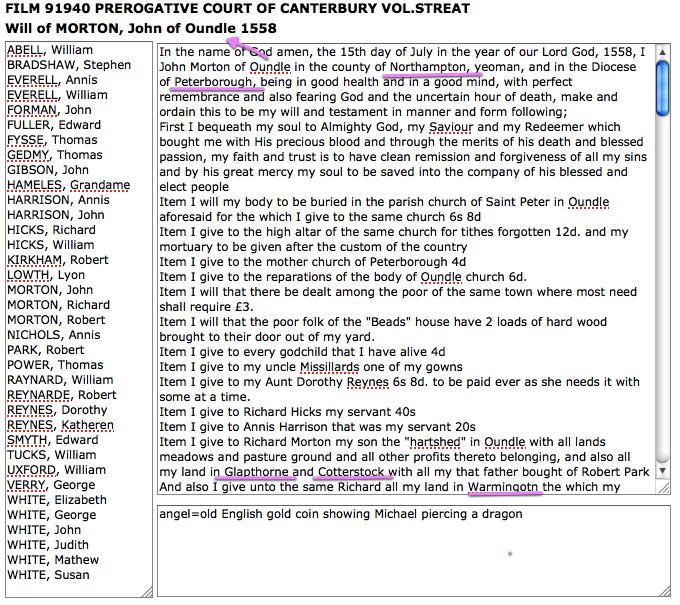 In some instances it will be impossible to get the search down to 20 Wills (40 if searching Content) so that the Will will be displayed in Display format. Example a simple search for WATTS results in many more than 20 hits. 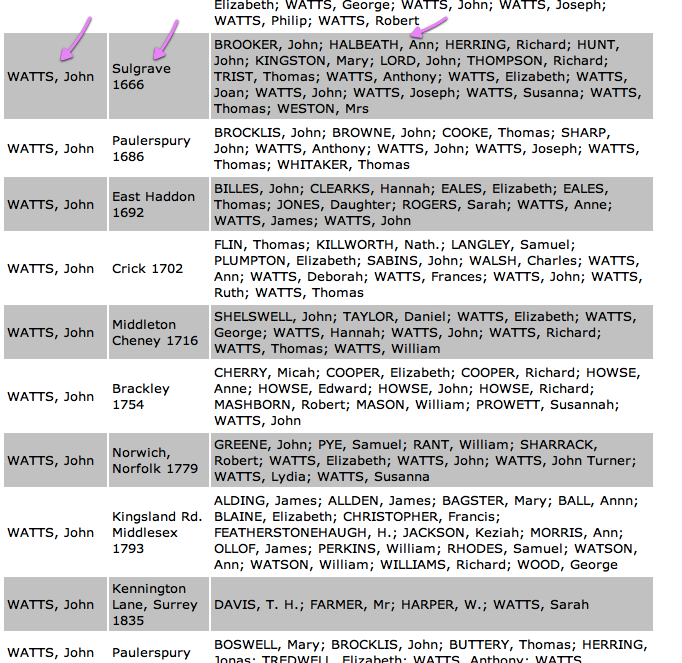 Even if the full name 'WATTS, John' is entered, the result is still more than 20 due to both names being so common; both as a Testator but more often as a Name Mentioned. If you scan the Summary format you hopefully will find a WATTS, John you are interested in. Lets assume you are interested in this WATTS, John or Sulgrave 1666. 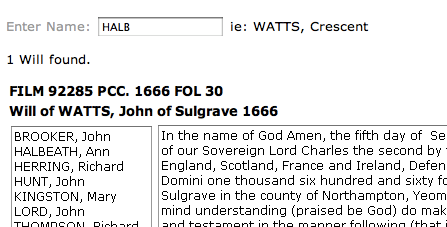 One possible solution is to do a Place Search, but in this case 'Sulgrave' is no help as there many Wills of Sulgrave. The answer always lies in finding a unique name. In this case HALBEATH, Ann . As can be seen all I need to enter is 'HALB' and I've narrowed my search down to a single Will - WATTS, John of Sulgrave 1666. In summary, identify unique names from the Summary format and you will quickly be able to do a search and have the exact Will presented in Display format. A Place search only finds the Testator's Parish as recorded in the Title. In the example below, a Place Search for 'Oundle' will find MORTON, John of Oundle 1558. To find Places that appear in the Content of the Will a Content Search must be used. In the example above, a Content Search of any Place mentioned in the above Will will succesfully find the above Will, plus others. Apart from searching for other Places that are mentioned in the Content of a Will, some other possible uses are to search for professions such as yeoman, haberdasher etc. Basically the Content Search page is provided as a 'if all else fails' opportunity to search the nitty gritty Content of every Will. Go back to Basic Lessons or move on to Advanced Lessons.